Hurricane Harvey Relief Efforts by the Houston Church in TX, U.S.
Hurricane Harvey hit Texas, U.S. The areas around Houston suffered a cataclysmic flood that might happen once in 500 years. The amount of rain in some parts of Houston from August 25 to 29 reached 1.31 meters (4.3 ft), which is the maximum in history in the continental United States. “Over the past four days, more than a trillion gallons of rain have fallen in Harris County alone—enough to run Niagara Falls for 15 days,” said Jeff Lindner, a meteorologist for the Harris County Flood Control District. It is estimated that more than 450,000 people lost their homes in Harris County, where Houston is located, as the floods hit 40,000 houses and 500,000 vehicles. 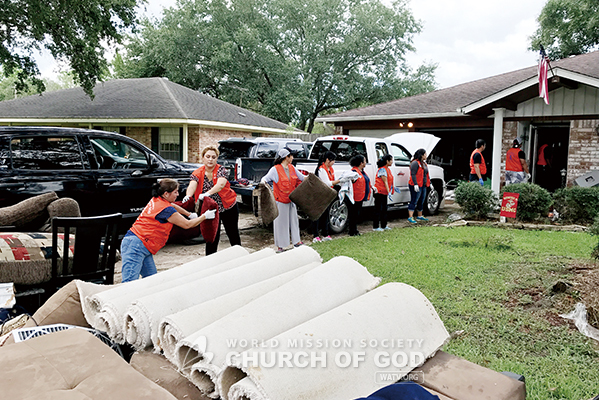 The overall damage of the city was so serious that the Church of God members in Houston immediately set out recovery work, following God’s words, “Love your neighbor as yourself.” A total of 420 members volunteered for nine days (about 2,000 hours) from August 30, when the hurricane began to shrink, to September 10, except Saturdays (the Sabbaths) and Monday. Getting advice from some of the church members who had personally been involved in the restoration work, the church volunteers went to Houston Beamer Road near the church. The situation was miserable. Because of powerful heavy rains, flooded vehicles and broken appliances were messed up on the road. The devastated road recovered its previous state little by little through three-day relief efforts, and the residents, who were deep in sorrow, began to regain their courage. The church members finished the restoration work for the Beamer Road to a certain extent, and went to Humble, which is an hour away from the church, on September 3. Because this area is low and has bad drainage, water came up even to three meters [9.8 ft] in some parts. That’s why the restoration work started late, and a total of 120 church members participated in it on Sunday. They took out broken walls, tiles, muddy furniture, and carpets from houses and cleared away dirt. For three days after this, more than ten members continued to assist with the restoration work. The residents shed tears of gratitude, seeing the church members devote themselves to the hard work. It is very rare that the victims receive such direct help. A citizen, who came with his son-in-law to help his relative, received an unexpected helping hand from the church members and posted an article on a social network service, which made the volunteer service of the Church of God known to many people. His son-in-law, a school principal of this area, explained in detail on the activities of the church members as a good example of the local community at his school meeting. Passersby handed water and snacks to the church volunteers, and residents themselves prepared meals for them. This way, a volunteer service brought forth another volunteer service, and a moving story led to another heartwarming story. The church members, who had completed emergency repairs that were required until the heavy equipment was put in, headed to George Brown Convention Center where the flood victims fled to for refuge, by the guide of the city hall official. Thousands of people who lost their places to go were staying there temporarily, but the staff members to sort relief goods and manage the kitchens and sanitary facilities were far from enough. After getting approval from Volunteer Houston, a representative volunteer group in Houston, which leads volunteer activities at the shelter along with the Red Cross, a total of 180 church members assisted the activities on Friday and Sunday. Johnny Jones, the manager of Volunteer Houston, said, “I’m deeply grateful to you on behalf of all the victims and volunteers here, and the City of Houston. You’ve changed the lives of all the victims.” Inspired by the active and genuine efforts of the church members, Volunteer Houston asked the Houston Church to become an official agency, and the Houston Church established a permanent partnership with Volunteer Houston to keep cooperative relations. On Friday, Mayor of Houston and Singer Janet Jackson visited the shelter to encourage the victims and thanked the volunteers. The activities of the church members, who regard the pain of their neighbors as their own, gave a great resonance to the community. It is anticipated that the willingness of the church members, who are ready to give a helping hand to anyone in need, will continue.